This recipe was originally intended to serve as a boo-boo cream. The kind of cream that’s applied to accident-related ouchies. The idea of using this recipe as a makeup remover was an accidental discovery. 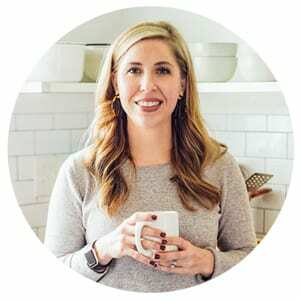 Behind the public photos and recipes on the blog, I live a double life. Don’t worry, this is a good kind of double life. I’m not a spokesperson for McDonald’s or anything crazy like that, lol. Behind the scenes, I work on freelance photography, recipe development, and video projects for companies in the natural world. Most of these projects don’t have my name attached to them, so you’d never know the photographer or recipe developer was little ol’ me. Last year, one of my freelance jobs required making an ouchie cream video. The recipe was incredibly simple: jojoba oil, beeswax, and a few drops of kid-friendly boo-boo essential oil blend. The recipe made a ton of ouchie cream, which meant that I was left with a giant tub of cream sitting in my medicine cabinet. A huge perk to being a recipe developer. PS: When it comes to food jobs, it pays to be my neighbor ;). The ouchie cream from that video job sat in my medicine cabinet for a few months. It was used from time to time when a child fell, and I didn’t have any of my homemade boo-boo cream available. A few months ago, as I washed my face and removed my makeup before falling into bed, I opened my medicine cabinet and suddenly had a multi-purpose revelation, I wonder if this ouchie cream would work to remove makeup, particularly my stubborn mascara? I grabbed a cotton ball, stroked it against the thick ouchie cream, and gently wiped my right eye. I pulled the cotton ball away from my eye to examine the results. There on the cotton ball sat my hard-to-remove-with-facial-cleanser mascara. That night, I decided to finish using the last few drops of my liquid makeup remover over the next few days, and start using the ouchie cream as my nightly eye makeup remover. 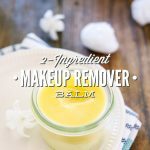 Here I am, a few months later, writing a do-it-yourself post for making 2-ingredient makeup remover. 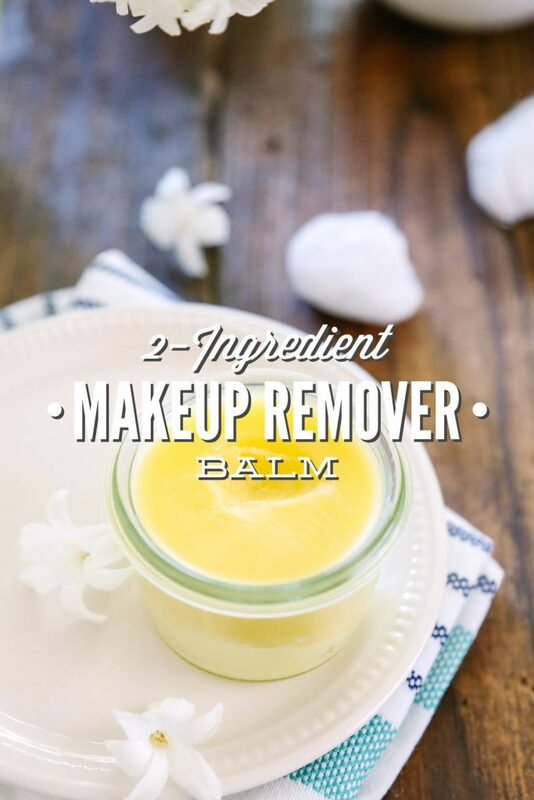 This makeup remover is like a balm since the ingredients are comforting and soothing. Makeup Remover Balm sounds like a professional title versus Accidental Makeup Remover. The “accidental” secret is safe between you and me, and the rest of the internet now. Jojoba Oil: Jojoba oil is actually a cold-pressed, liquid wax versus an oil. Jojoba oil is held in high-esteem in the natural beauty world because it mimics the oils that our bodies naturally produce. I’ve used jojoba oil as a moisturizer over the years in my face wash, facial cleanser, liquid makeup remover, shea butter lotion, wood furniture polish, and now this makeup remover balm. This usage chart from Dessert Essence includes severals practical ways to use jojoba oil. Some people may find that jojoba oil is too heavy, so I’ve included other oil options at the bottom of the recipe (below). Beeswax: Beeswax is mainly added to this recipe to take a liquid oil to a firm state. The beeswax also adds a few benefits beyond the consistency factor. Beeswax, a natural ingredient thanks to hard-working bees, provides a protective barrier to the skin without clogging pores, and may also help to soothe the skin. 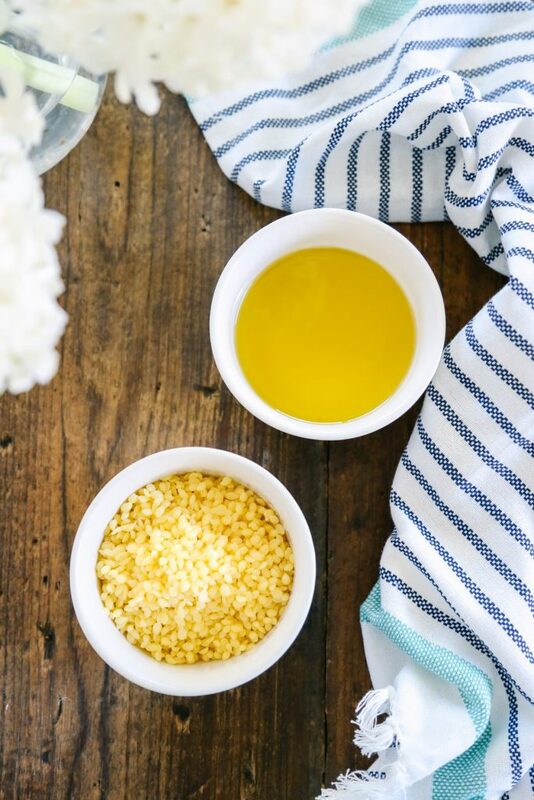 Beeswax is the ingredient that takes this makeup remover from an oil to a balm. 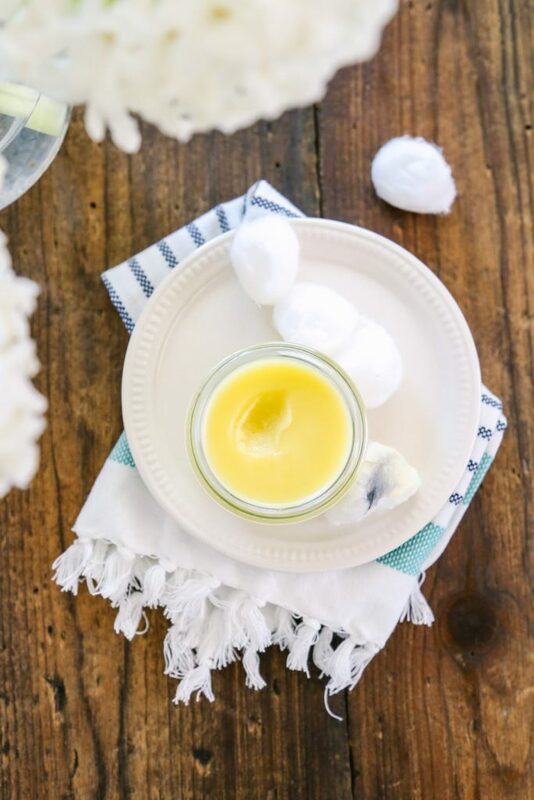 This makeup remover is like a balm since the ingredients are comforting and soothing. 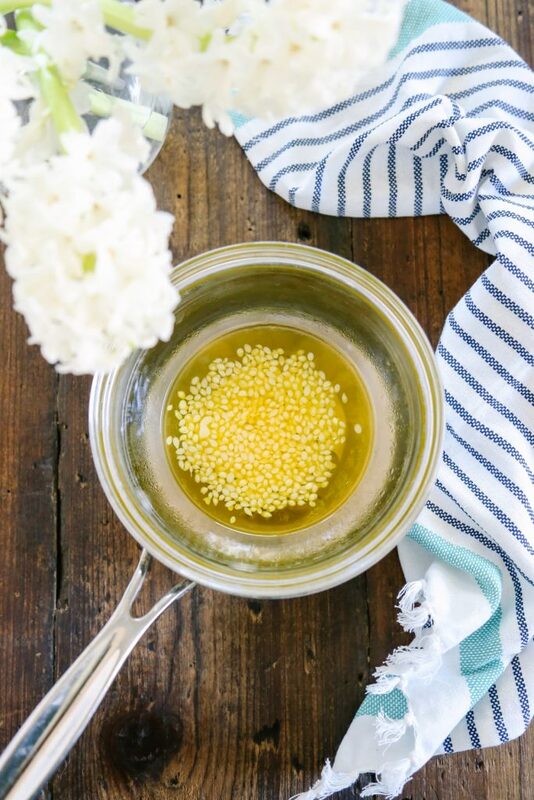 Add the oil and beeswax pellets to a double boiler, or you can use a glass or metal bowl set over a pot of boiling water (as seen in my photo). 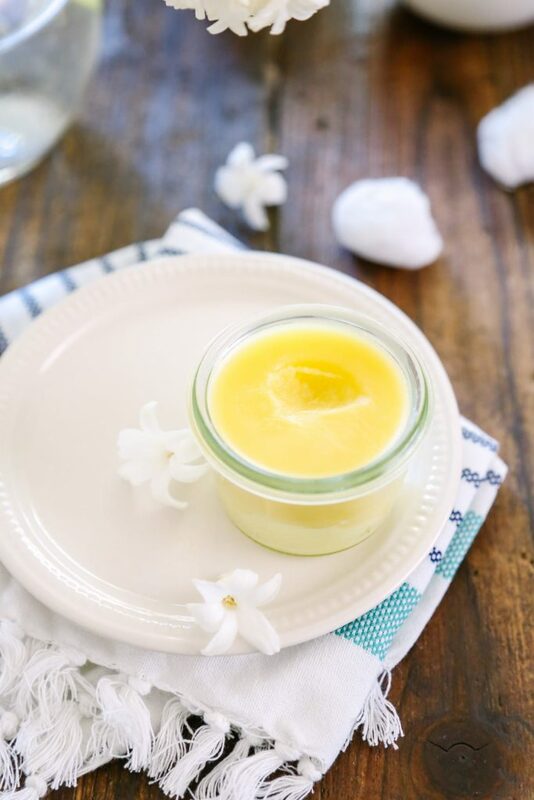 Once the beeswax melts, pour the makeup remover balm into a storage container (with a lid). Allow the makeup remover to set and cool before use. Store the sealed makeup remover in a cool, dark place for several months. To Use: Using a cotton ball, scoop out a small amount of makeup remover. 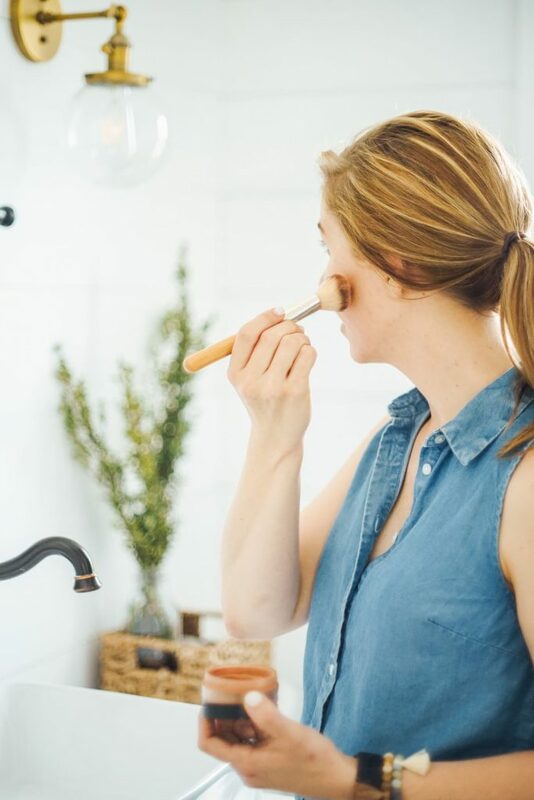 A little bit goes a very long way, so you don't need a ton of makeup remover to get the job done. Gently wipe off makeup using the cotton ball. Follow-up with a facial cleanser. My facial cleanser and Clarisonic Mia do a great job at removing powder and/or liquid foundation, so I really don't need the makeup remover for anything other than my mascara. 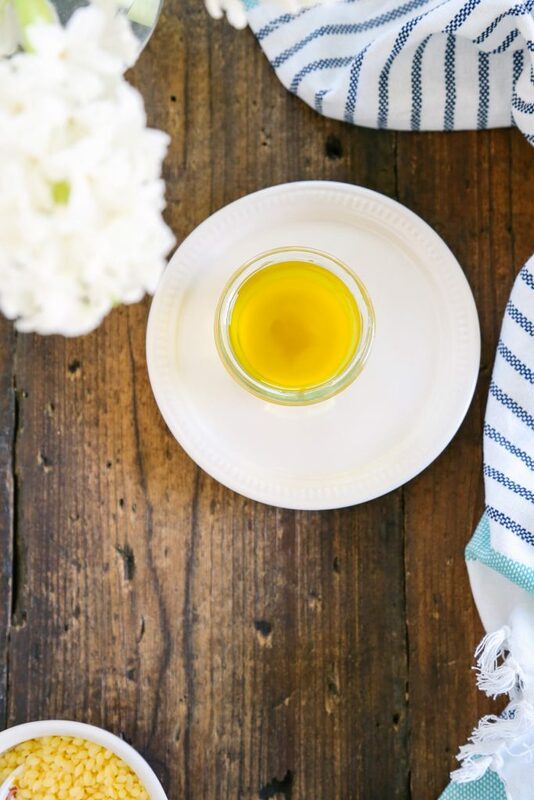 I prefer jojoba oil in this recipe, but I’m sure you could also experiment with other oils, like olive oil, apricot kernel oil, grapeseed oil, and almond oil. You could also try a mixture of two different oils if the jojoba oil is too heavy. You could also use oil as-is to remove makeup, without adding beeswax. I really prefer the thick consistency of this balm over straight-up liquid oil. I’ve also found it’s much easier for oil to accidentally drip into my eye (OUCH!) when using oil from a bottle. I’ve thought about experimenting in the future with adding aloe vera or rose water to this makeup remover, but that experiment is for another day and time. Kristin, i’ve heard that beeswax kinda comedogenic. Do u have any recommendation to replace it? Thanks! Can you use it after it cools or does it have to sit for a couple of months? Hey Sheri, You can use it immediately after it cools. PS: I just recently started using this on my whole face before cleansing and I’m shocked (in a very good way ;)) at the amount of makeup it removes. Enjoy!! i think I will try this recipe as soon as I finish my huge bottle of makeup remover. Would it be beneficial to add a couple drops of lavender or jasmine essential oil? Hey Serendipity, Definitely, I think adding the essential oil would be lovely! Kristin, i love this product on my skin. I also offered it to my friends and ones of them complained that it is too oily. Some would like to use this balm only to remove impurities, not for make up. How can I adapt/alter the recipe to be less oily? Thank you and keep up with the good work. Hey Avram Oana, I’m so glad you’re enjoying it. There really isn’t a way to make it less oily, other than using a different oil. Something like grapeseed oil or almond oil may help reduce the oily feel. I also recommend washing the skin after using this, too. Just wondering if you have or can use Avocado Oil instead? Hey Tina, Yes, you probably could. I haven’t tried it in this recipe. hello Kristin! does this balm goes from balm to Oil when apllied to skin? like a silky texture? also how long is the shelf life? Hey Safeeya, It has a balm-like texture, similar to a body butter or lotion when applied to the skin. The shelf-life is about 12 months (could go longer due to the jojoba oil shelf life).